By now, I hope that we have all accepted that email is certainly not dying or becoming extinct, it is very much alive and well–continuing to be the marketing channel with the highest return. Those with successful email programs are those who are building a relationship with their recipients and delivering on their commitment to deliver valuable content. Then, they are testing, innovating, and trying new techniques to see what resonates with their audience. As we jump start our 2019, I want to share my predictions of 3 trends in email marketing and how to stay ahead of the curve. No matter your industry, your recipients are time-starved and their inboxes are full. Now more than ever, you need to develop ways to break through the noise in the inbox and deliver email that your customers will be excited to open. Each of my predictions center around exceeding your recipients’ expectations in new ways. For years I have talked about segmenting your email list and sending content that feels unique to your customers. We have looked at examples of companies sending recommendations using past purchase information, or following up on more content after you see a specific download. In the past few years, more companies are doing recap emails where companies highlight not just their company stats but also how their customers use their service or app. The new year is a great time to start that, but don’t be constrained to doing this only once throughout the year. In 2019 I believe that successful marketers will be showing their users that they are paying attention to how they are using their services and drawing them in with helpful suggestions on how to further utilize the app, service, or product they are marketing. The meditation app Headspace is a great example of a company doing just that. 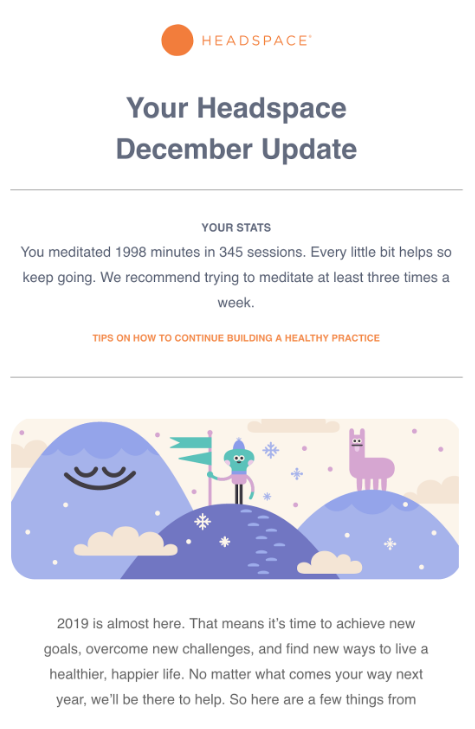 Headspace not only shows my stats and interaction with the app, but also offers additional content and offers to add more value to my meditation practice. Another exciting trend I expect to continue and evolve is the use of animated GIFs. Rather than having a static image of a screenshot of your product, now you can animate GIFs to show exactly how something works. Want to show different views of a piece of clothing, or a new feature in your product? Include an animated GIF inside the email content. From our own testing at SendGrid we have seen that even a simple animated GIF dramatically improves engagement with our email. You have very little time to engage your recipients and instead of large blocks of content, a GIF is a way to tell your story and deliver value in a short amount of time. Trunk Club uses an animated GIF to show a variety of sweaters that are available to entice subscribers to click on the new styles. There are several different ways to build GIFs for your emails. If you have access to Adobe Photoshop, you could upload a video or create a frame-by-frame gif within its applications. But even if you don’t have accesses or time to create one that way, you can always use the free online GIF generator and image hosting platform, Imgur. Just keep in mind that this option limits you to a 15-second clip of your video and requires you to host the GIF online (on YouTube or Vimeo). Timing is everything and I know many email marketers (myself included) have struggled with getting the timing of their email just right. For example, in the B2B space, you segment a list of users who aren’t using a feature or need to upgrade to a higher package, and before you hit send, they inadvertently start using that feature or upgrade. By the time they receive your email, they may be confused or, even worse, a bit annoyed. Dynamic content is an incredible trend that I predict will be used more in 2019 because it gives markers the ability to change the content of email and the offers they are sending in real-time. It is another way that you can connect with your customers and assure them that you do know and understand their behavior without sending offers for items they have already purchased. 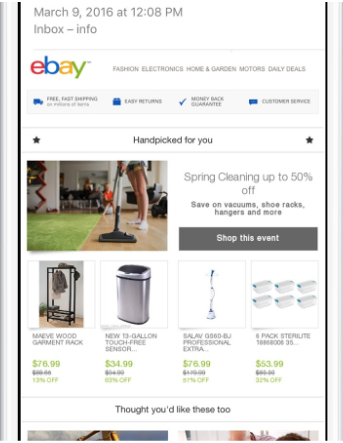 eBay changes the content of their offer at the time of open to account for auctions that have ended keeping every email highly relevant. The online auction space is constantly changing so using dynamic content allows eBay to stay ahead of the buyer and provide the most relevant content. 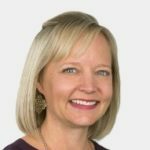 I am confident that 2019 is sure to be a year where senders try new things and spend time and energy thinking about how they will connect with their customers. If you are sticking to your same old playbook of years past, you are missing out on the opportunity to provide value, see the highest return possible from your email channel, and create lasting relationships with your subscribers. Try these 3 new trends and stand out in that crowded inbox in 2019! And if you’re looking for some additional inspiration, check out our 2019 email marketing example guide to help spark your next great email campaign!